This site is about things I like, and will contain information that I've had trouble finding elsewhere on the internet, like how to Kick Start a 500cc Royal Enfield Bullet or Honda XL500R without hurting yourself. That's me in the picture doing what I love to do, riding Mulholland on my Bullet. I like motorcycles. Weird old motorcycles. Riding a motorcycle is a form of karma yoga. Karma literally translated means "action." Many people have misinterpreted it as the law of cause and effect, but that is not accurate. Though it is true that if you are truly connected to everything, and everything is connected to you, then that which you do to another person, you are also doing to yourself, because you are that, they are that, and that is all there is. But this doesn't mean you will be punished for doing bad things to other people, or that someone is keeping score and will even things up before you die. Riding a motorcycle is a way to clear the mind, interact with physical reality, and feel connected to the world. I like it. There are other benefits to riding motorcycles as well, including free motorcycle parking at LAX Los Angeles International Airport and riding in the carpool lane in California. I had a 1976 Moto-Guzzi V1000 Convert motorcycle, that's an Italian bike with an automatic transmission, kind of like a big scooter. There's not much info on this bike on the internet, so I've put together a page on things I know about them. Moto-Guzzis are good bikes. If you're considering getting one, do it. The automatic, or Convert model sells pretty cheap. I've seen 2 good running examples for sale locally lately for around $1,800, which is cheaper than a standard 4 or 5-speed model. I also have a 1982 Suzuki GS650G motorcycle. This bike is all about the essence of why I ride a motorcycle. I don't ride it because it's faster than other bikes. It isn't. I don't ride it because I like the attention from everyone who sees me on it. There isn't any. I ride it because I like riding motorcycles. There is no ego involved in riding this bike. It's all about the ride. If you're looking for an old-school 1970's standard UJM (Universal Japanese Motorcycle), get a Suzuki. They are the best-handling, most reliable, best-engineered, toughest bikes of the era. The GS650G is a great example, often overlooked in favor of the larger-displacement bikes. I put 17,000 miles on a 1978 GS1000, which was also a great bike. I'll put a page together about my Suzukis, but there are some really great sites out there, so I'll also add lots of links. My favorite is www.thegsresources.com. Any technical question you want to ask has already been answered in the forum section of the site. I have a 1982 Honda XL500 with an XR500 motor, which I recently purchased from a guy who took it all apart and repainted the frame and put in a new piston, cam and valves. It's great to be on such a light bike. It's very easy to ride. It feels like cheating when compared to my heavier bikes. And it gets 60 miles per gallon!!!! I'm working on a 1971 BSA Lightning, which I bought it pieces. It should come together nicely sometime in the next decade and be a fun classic motorcycle for short rides in the mountains. It's won't get as much attention as my Moto-Guzzi, but I need a British parallel twin in my collection, and it should be lots of fun to ride. I recently sold my 1996 Harley Davidson XL883 Sportster and used the money to buy my Suzuki, BSA, and Honda. I bought it new and put 43,000 miles on it, and rode it as my only form of transportation for a few years. It was a good bike, but too slow and vibey. I put a Thunderheader 2-into-1 exhaust on it, which I highly recommend if you don't mind your motorcycle being REALLY LOUD. Probably as loud as straight pipe, as it is shaped like a megaphone and has very little baffling in it. Along with the Screaming Eagle air cleaner kit and a little carb work, I had more power at all engine speeds, and significant improvement in the top-gear 60-80 mph roll-on. Also, I hate the classic Harley-Davidson handlebar vibration, so I installed a Fisher harmonic balancer to smooth it out. Someday I'll take a ride on one of the new rubber-mount Sportsters and see what that's like. I recently picked up a 1991 Harley-Davidson FXRS Super Glide for $4,800, and I love it. When it was new it cost twice as much as a Sportster, and it really is twice as good on the freeway, though not as fast around the corners. The motorcycle that gets the most attention is my 2001 Royal Enfield 500 Bullet Classic. 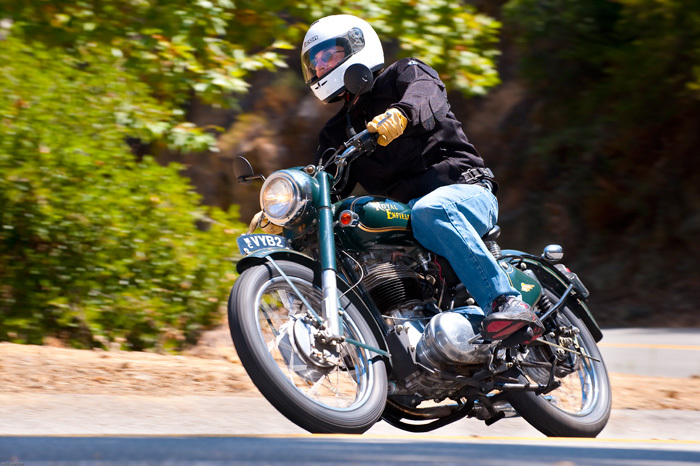 I live in California, where there are no Royal Enfield dealers because the bikes can't pass the CARB environmental requirements to be sold in the state. It's a really neat little bike for cruising around town, and everywhere I go people ask me questions about it, even when I'm driving in traffic. Used ones sell for $2,000 - $3,000, so it's a cheap way to get yourself a bike that gets more looks and comments than a $30,000 chopper. And it's fun to ride something so old and primitive. Long ago I had a Triumph Bonneville-powered chopper. Best modification I made to it was getting rid of the Amal carbs and replacing them with stock CV carbs from an old Honda CB450. I didn't even have to change the needle position or jetting. Just tweaked the fuel mixture a little, and the bike started on the first kick every time (Unless it had electrical or mechanical problems, which it often did.) My advice to anyone thinking of buying an old Triumph is buy one of the new Bonnevilles. They have the classic British look and are smooth and reliable. I sold my chopper because I knew that if I didn't it would kill me. If you like yoga, check out www.poweryoga.com. I learned yoga at their studio in Santa Monica, and they have some really good and challenging videos. Also, I've been getting into Pilates lately. www.heartofpilates.com is a studio in my area, who have put out workout videos called Heart of Pilates. They have a show running on PBS, and their videos are quite good.